Are Virtual U2 Concerts Even Better Than The Real Thing? Tech-savvy superfans set up elaborate gigs starring their favorite band for online gamers. "No hoochie hair" ("So that this concert may be enjoyed by the maximum number of people"). "No particle poofs or particles of any kind." And ... "DO NOT IM the band while the concert is in progress." Failure to obey these edicts doesn't get anyone physically kicked out because no one is really at the concert. 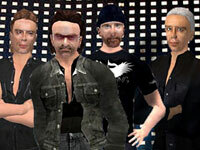 It's all taking place through computers: a massively multiplayer musical experience created and enjoyed by people logging into the virtual world "Second Life"
Since last year, a small group of players has taken advantage of the blank slate and creative flexibility of "Second Life" to create the stage sets, the bodies and the moves of their favorite band: U2. They've helped pioneer the concept of virtual concerts — shows that are attended not at a stadium or club but in front of a monitor and keyboard. Since 2005, four members of the U2inSL crew (U2inSL.com), living in locations as distant as California, Connecticut and Germany, have logged onto their computers and into the shared landscape of "Second Life" in order to steer digital replicas of Bono, the Edge, Adam Clayton and Larry Mullen Jr. Running their characters through a series of stage moves and piping in audio recorded from an actual concert, they are able to create a virtual performance. Other "Second Life" citizens can attend as members of a character-packed audience. The anonymous players behind the virtual band said they've tried to contact U2 management to make sure this is all OK. They're not making any money off of it, and they adorn their concert area with signs urging people to donate to the real U2's One Foundation charity. But the real band has yet to respond. U2 management also did not comment on the virtual U2 for MTV News. A virtual — and unauthorized — U2 might be the most provocative example, but independent musicians and big-label acts are also getting involved, potentially making multiplayer video game worlds the next frontier of touring. Musicians can channel audio into game worlds and set up characters to be their puppet personas — a way to go on tour without leaving their keyboard, be they the "SL" musician Frogg Marlowe or, if Universal Music's official plans continue to take shape, Chamillionaire and the rock band Hinder (see "GameFile: Chamillionaire's Ridin' Virtual, 'Saint's Row' Has A Surprise, Anti-Game Laws Gain Steam And More"). "It's really a rush, like being in a real-world concert," the virtual Bono told MTV News. The members of U2inSL prefer not to use their real names in public "to keep the mystique and excitement," according to the unreal Bono. "This is role-play after all." The group gathered for a concert this past weekend after two months of inactivity due to an injury suffered by one of the members. In April, MTV News attended a small invitation-only concert where the U2inSL crew provided an education on how a virtual concert works. Physically it requires nothing more than logging onto a computer running "Second Life" and digitally walking — or flying — to the concert's location. In April, that locale was a tropical island called Dragon Moon. The concert organizers can block unwanted guests by requiring a digital ticket, without which an approaching player will see their character run into an invisible wall. Before the April concert began, the virtual bandmembers hung out in the band room. "Second Life" doesn't support voice chat, so Bono was text-chatting with the Edge. Next to their building was a large concert stage. On the far side were two porta-potties. The concert area was about 100 virtual feet from the edge of a beach, the stage facing the water. Behind the audience pit, just out of reach of a lapping tide, was a concession stand, a T-shirt booth and a bar. A mouse click on those spots would generate virtual hot dogs and beer or a U2 outfit that can be zapped onto a character's body. "Second Life" is different than other massively multiplayer games like "World of Warcraft" and "EverQuest," not just because it doesn't actually contain any game-oriented goal but because it allows players to create everything in the world. Players can create characters that look like monsters, supermodels, Bono or whatever else they can think of while messing with the program's modeling tools. Everything a player creates is stored on servers at "Second Life"'s parent company, Linden Labs, and has to be transmitted back out to any other players who would need to see it, say, because they're walking past the Bono character or watching him perform onstage. This presents a problem if too many people are standing around in the game trying to watch Bono at the same time. The Linden Labs server begins to feel the strain of sending the same graphics out to more and more attendees. So if too many people come to a virtual concert in "Second Life," the world is going to stutter. Popularity can cause a slowdown. That didn't happen during the April concert, in part because people followed the rules. The ban on "hoochie hair" and "particles" was really a ban on attendees bringing graphically elaborate hairdos and special effects that would put more strain on Linden Labs' servers. Until the audio feed is activated, the virtual concert is practically silent. But once it was on, the band "played" a 14-track set, which included streamed audio of the real U2 playing "Vertigo," "Elevation" and "Where the Streets Have No Name." The final cued track of the evening was real-life crowd applause. The members of U2inSL don't have to sing, but they have to make sure their characters hit their marks and make the appropriate motions (hold microphone to mouth, throw arms in the air, spin around, etc.) "I rehearse steady for about a week," the fake Bono told MTV News. The concert in April went smoothly, though not without at least one kink. "I missed hopping at the keyboard for 'Miss Sarajevo,' " the virtual Edge confessed. A "Second Life" concert is an odd place. A mysterious object in front of the stage proves, with a curious mouse click, to be a dance machine. It immediately causes the player's character to start dancing with energetic spasms. Anyone else clicking winds up with their character also dancing, in perfect unison with everyone else. Dancing doesn't take any sustained effort. It just happens — and keeps happening long after some of the people too busy text-chatting remember they're still doing it. It's all done with computers, after all. After the April concert, the fake Bono demonstrated how a few mouse clicks can generate a complete wardrobe change. But those Linden Labs servers aren't so fast that one shirt just swaps for another. " 'Zip' ain't a word when changing clothes," he said, as a red-and-black tunic faded in to replace a black leather jacket. Another weird touch: People wanted to hug goodbye, but one of them hadn't set his character up properly to do it: "Sorry, dear, took hug attachment off. I'll have to dig it out of inventory later," he responded. Virtual concerts — even better than the real thing? Well, a bit different at least. Copyright © 2006 MTV Networks. All rights reserved. This page contains a single entry by Jonathan published on June 27, 2006 4:22 AM. Apple Relaunches U2 Special Edition iPod was the previous entry in this blog. Chili Pepper blasts 'sell-outs' U2 and Black Eyed Peas is the next entry in this blog.